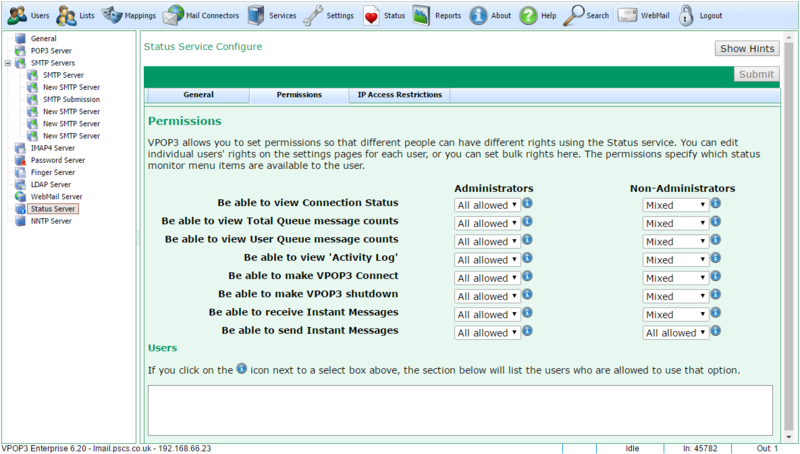 This page lets you set who can access the various functions of the VPOP3 Status Monitor. On this page you can only set permissions for all administrators or all non-administrators. To set permissions for individual users, go to the User's Permissions tab. •Be able to view connection status - the user can see whether VPOP3 is collecting/sending mail or idle, etc. •Be able to view total queue message counts - the user can see the total number of messages waiting in users' inboxes. •Be able to view user queue message counts - the user can see the number of messages waiting in individual users' inboxes. •Be able to view 'Activity Log' - the user can see the details of sending/receiving messages, including who the senders & recipients of messages are. •Be able to make VPOP3 connect - the user can tell VPOP3 to start or stop a connection to send and/or collect messages. •Be able to receive Instant Messages - the user can receive basic instant messages from other VPOP3 users through the status monitor. •Be able to send Instant Messages - the user can send instant messages to other VPOP3 users through the status monitor. For each option you can choose All allowed or All denied to say that all users of that type are allowed or not allowed that permission. There is also a Mixed option which will display if different users of that type have different access to that permission. If you click the icon to the right of the drop-down box, the section at the bottom of the page will list the users who are allowed that permission. This is an aid. You cannot alter the users who have the permission through that page: it is read-only.